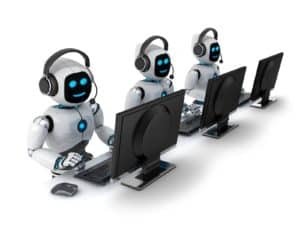 Robotic Process Automation (RPA) can generate significant cost savings with increased productivity and quality, enhancing customer experience and business results. Read more about RPA strategy and delivery here. The challenge comes in how to frame an approach that gets the job done with optimum impact, risk and cost, achieving a sustainable delivery regime whilst balancing tactical and strategic imperatives. 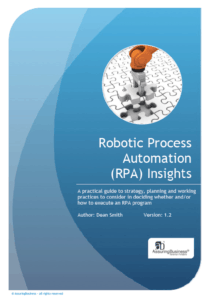 Many businesses, in all sectors, are now driving RPA strategies. It makes huge commercial sense; improved efficiency, operational quality, governance/controls and productivity all up for grabs. Ultimately those customer experience and cost targets get a lot easier to hit with a well-considered RPA program integrated into the overall automation and workforce planning initiatives. RPA can deliver rapid and meaningful results. Building your RPA plans in the context of a wider technology, process, and organizational strategy makes a lot of sense. For example, RPA could be considered ‘disposable’ when positioned in a wider transformation or automation strategy to ensure that the business case for fundamental lasting change is not dismantled. Selecting the right RPA vendor(s) is imperative. There are numerous technology variants and environmental requirements that can make significant differences to the implementation journey and Return On Investment (ROI). It is possible that multiple RPA tools, or maybe augmentation of one tool with additional technology, e.g. advanced Optical Character Recognition (OCR), cognitive AI components or chat-bot type tools, are required to optimize cost-benefits. Moreover, the approach and commercial frameworks of vendors differ substantially and these can make a big difference in the cost and ease of delivery. Understanding the RPA opportunity and specific requirements in your business is just the starting point. Finding the right vendor(s), understanding technology requirements, and ensuring delivery compatibility within a sensible commercial framework can mean the difference between success and failure. AssuringBusiness has many years of vendor engagement experience to leverage in selecting RPA components and vendors. Undertaking a thorough and transparent selection process need not be laborious or lengthy if the right structure and prior knowledge are used as a platform. Working closely with the relevant Procurement or Strategic Purchasing team ensures the best possible outcome; leveraging pragmatic domain experience and core procurement practices to bring excellent commercial and relationship frameworks to life. Vendor relationships within a Delivery Practice that are sure to get the job done in the expected cost, quality and time framework. Businesses can now actively plan and engage a digital workforce alongside humans as it navigates its evolution. Whilst established and mature businesses can bring about significant transformation, new businesses arguably have an even greater opportunity to plan and build a hybrid workforce without the challenges associated with human workforce displacement. And when considering the opportunities with Shared Service Centers (SSC), Global Business Services (GBS) and/or Business Process Outsourcing (BPO) partners, the scope, and potential benefits are greatly enhanced. AssuringBusiness will work with Human Resources, Operational Excellence, and business owners to design practical short-, medium-, and long-term workforce plans in the context of the overall RPA strategy. Identifying RPA opportunities and devising the optimum digital-human workforce strategy. Working closely with HR to minimize the impact of affected team members, design and deliver appropriate employee communications and develop talent management plans to cater for RPA enabled operations. With so many options and approaches to RPA, let alone the potentially costly impact of a poorly conceived approach, it can be a little daunting. So why not learn from the lessons of others? No need to make the same mistakes. And getting into the delivery groove in a way that reflects your business culture and needs is clearly going to make a big difference. In-house, outsourced and hybrid delivery models are all common and each will have varying benefits depending on the business and its culture. Developing a systematic delivery methodology that takes advantage of low-hanging fruit whilst considering the bigger strategic picture is essential. AssuringBusiness helps to navigate the path to establishing a successful, highly effective RPA strategy and delivery program. We will work alongside your existing team or lead a program for end-to-end delivery as a trusted partner, leveraging internal and external resources to suit business culture and budgets. Optimising the discovery, design, delivery, testing and operational maintenance of RPA is more straightforward when incorporating some well-earned insights to steer the way, reducing the risk and cost of a successful RPA program. Our services include end-to-end options (discovery, assessment, process deep-dives, project management, vendor management, RPA configuration, project governance etc. ): supporting role, program lead or outsourcing delivery and/or developing your internal teams towards systematic and sustainable practices. See also our Performance and Innovation Center (PIC) services.